If you’re a regular pokie player, you’ll know that ancient Egypt is one of the most popular slot settings out there. It’s easy to see why so many of us love spinning reels set among pyramids, deserts and the River Nile- as this was an era filled with magic and majestic beauty. The recently released Book of the Dead by Play ‘n’ Go might be one of the best Egyptian-themed slots around and it looks like we’re not the only ones to have taken a shine to it. Mr Green Casino is celebrating the arrival of this great new game by treating players to an exciting prize draw. Could you be one of the 25 lucky legends to come away with some of Mr Green’s treasure hoard? By playing Book of the Dead at Mr Green Casino during the promotional period, you will earn entries into the random prize draw which will be held on January 16th. These prizes come in the form of real money, which means that there are no wagering requirements to play through. Once the prize money has appeared in your account, it’s yours to withdraw! As if all of this wasn’t reason enough to get involved with this exciting competition, don’t forget that the Book of the Dead slot itself has truly incredible prizes waiting to be uncovered. Keep on reading to find out more about this slot. This promotion kicks off on January 12th and will remain active until midnight on January 15th. Every 20 rounds (at a minimum of 50p per spin) that you play on Book of the Dead during this time will earn you one entry into the prize draw. There is no upper limit to how many times each player can be entered into the prize draw. You can spin and win at Book of the Dead and earn entries as much as you feel like. 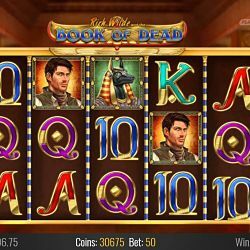 Book of the Dead is a five reel, 10 pay line slot with a theme to thrill history-buffs and gameplay and bonus action that will keep anyone entertained. Every aspect of the game’s design revolves around the wonders of ancient Egypt. The main character is a dashing archaeologist named Rich Wild, he and the dazzling ancient artefacts he has uncovered all act as symbols on the shimmering gold reels. Coin values range from 10p to £100, making Book of the Dead an appealing game for every type of gambler- especially when you consider the gigantic jackpot offering of 250,000 coins. As well as this impressive base game, the slot is also packed full of extra features. From cash prizes worth 5,000X your bet, to dozens of free spins, the bonus rewards in Book of the Dead are well worth digging around for. This promotion will run from the 12th until the 15th of January. Only gameplay in the Book of the Dead slot during this time will qualify for the prize draw on the 16th. Players must play at least 20 rounds of the slot at at least 50p per spin to earn entry for the Cash Drop promotion. 25 players will be drawn at random on the 16th for the £6,000 prize pool. All winners will have their cash prize credited to their account within 72 hours of the prize draw being held. This will be paid in real money, not bonus funds, so will be free from wagering requirements.